"With her brilliant debut [album], Bekah Simms immediately positions herself at the vanguard of contemporary composers...Brash and uncompromising, Impurity Chains is by no means an album for casual listeners, but anyone looking for a truly exciting, innovative and evolved take on contemporary composition should be utterly enthralled by the extraordinary vision presented here by Bekah Simms." -Exclaim! JUNO Award-nominated composer Bekah Simms' varied output has been heralded as “nuanced and complex” (NOW Magazine) and “cacophonous, jarring, oppressive — and totally engrossing!” (CBC Music). Propelled equally by fascination and terror toward the universe, her work is often filtered through the personal lens of her anxiety. Foremost among her current compositional interests is quotation and the friction between recognizability and complete obfuscation. Bekah hails from St. John's, Newfoundland but is currently Toronto-based. Her music has been featured across Canada, in over a dozen American states, Italy, Germany, Austria, and the UK and interpreted by a diverse range of top-tier performers including Esprit Orchestra, Continuum Contemporary Music, the Victoria Symphony Orchestra, the Madawaska Quartet, TorQ Percussion Quartet, and Duo Concertante. She's also the co-founder and co-artistic director of Caution Tape Sound Collective with August Murphy-King, with whom she has presented concerts of new boundary-pushing repertoire since 2015. 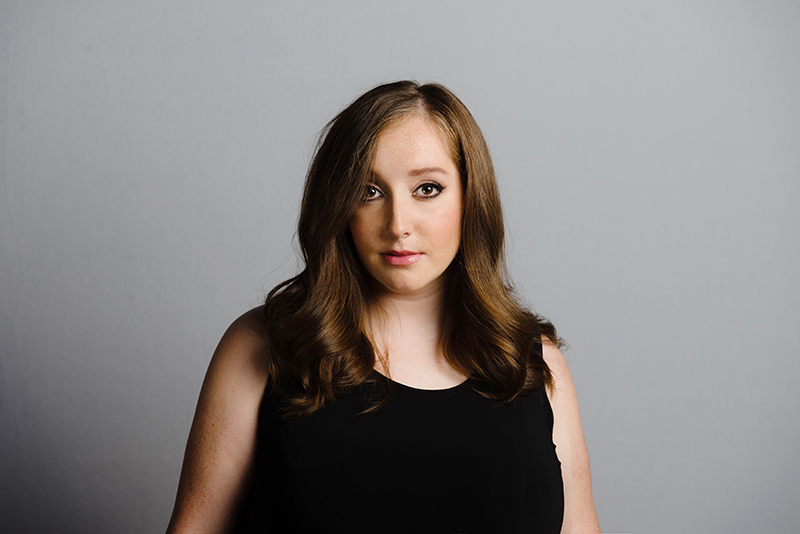 In addition to commission and recording funding from the Canada Council for the Arts, Ontario Arts Council, and Toronto Arts Council, Bekah has been the recipient of over 25 awards and prizes, including the 2017 Toronto Emerging Composer Award and the 2018 Karen Kieser Prize in Canadian Music. Her work "Granitic" was nominated for the 2019 JUNO Award for Classical Composition of the Year. Her music has twice been included in the Canadian Section's official submission to World Music Days (2016 & 2019), and in 2016 the CBC included her among their annual 30 hot classical musicians under 30. Bekah holds a DMA and M.Mus in music composition from the University of Toronto, and a B.Mus.Ed. and B.Mus in theory/composition from Memorial University of Newfoundland. Bekah Simms (b. 1990) is a Toronto-based JUNO Award-nominated composer and educator originally from St. John's, Newfoundland who was named by CBC as one of Canada's hot 30 classical musicians under 30 and the winner of the 2017 Toronto Emerging Composer Award. With work described as "deliciously disorienting" (Nick Storring), "relentlessly creative...truly exciting, innovative and evolved" (Exclaim! ), and "nuanced and complex" (NOW Toronto), Bekah is increasingly known as a highly individual composer redefining classical music. Her music consists of a highly varied output using a wide variety of media, including electroacoustic and acousmatic works, chamber music, opera, wind ensemble, and orchestra. Propelled by a simultaneous fascination and terror of the universe, Bekah's music is usually filtered through the lens of personal anxiety. Among her current compositional interests is the interaction of quotation, obfuscation, and distorted elements. Bekah's music has been performed and commissioned by first-class ensembles and soloists, including the Victoria Symphony Orchestra, Continuum Contemporary Music, Esprit Orchestra, the Array Ensemble, the Madawaska Quartet, and Duo Concertante. Her works have been presented at the Toronto Symphony Orchestra's New Creations Festival, the Royal Conservatory of Music's 21C Festival, and New Adventures in Sound Art's Sound Travels Festival of Sound Art, among others. Her music has been included on Musicworks' CD series (CD #128) and broadcast on national CBC radio, Montreal's Pulsar, Vancouver's RE:composition, and Cambridge, MA's Not Brahms and Liszt. Many of her chamber and solo works featuring distortive elements are featured on impurity chains, a portrait album released through Centrediscs on September, 2018. The creation and recording of Bekah's music has been supported by the Canada Council for the Arts, the Ontario Arts Council, the Toronto Arts Council, and the Department of Canadian Heritage, and featured from coast to coast in Canada, the United States, and Europe. She is an alumna of several prestigious composer training institutes, including Yale's Norfolk New Music Workshop, June in Buffalo, Banff Centre for the Arts, Soundstreams' Emerging Composer Workshop, and the Array Young Composers' Workshop. She is Co-Artistic Director and co-founder of Caution Tape Sound Collective, an endeavour inspired by her commitment to experimentation and exploration within her practice. Caution Tape Sound Collective has received the support of the SOCAN Foundation, the Toronto Arts Council, and the Ontario Arts Council. Bekah has received over twenty-five awards, prizes, and call-for-scores selections. She has received prizes and call-for-scores selections from organizations including the International Society for Contemporary Music, GroundSwell, the Canadian Music Centre, the Canadian University Music Society, Association of Canadian Women Composers, Sandbox Percussion, New Fangled Opera, North American New Opera Workshop, Etobicoke Philharmonic Orchestra, Grains of Sound New Music Festival, Verdant Vibes, Newfoundland Arts and Letters, the Lyra Society, the Flute New Music Consortium, CelloLoft, a very small consortium, and the Zvi Zeitlin Memorial International Composer's Competition. As an educator, Bekah holds a B.Mus.Ed. (K-12, choral & instrumental) from Memorial University. She spent three months teaching rock and pop-based classroom music, as well as leading the choral program, at Burnt Mill Academy - a performing arts middle school in Harlow, UK. SInce then, Bekah's teaching experience has largely been in the post-secondary realm as a Teaching Assistant at the University of Toronto. In this capacity, she has taught a number of tutorials and lectures in a wide variety of courses including Styles in Composition, Topics in Composition I and II, Computer Applications in Music, and Musical Skills. In her role as Outreach Coordinator at New Adventures in Sound Art, she has led and assisted in delivering sound art workshops to both children and young adults during public school visits and day camps. She has served as a composition mentor for Esprit Orchestra's Ontario Resonance project and the Waterloo Region Contemporary Music Sessions. At WRCMS, she also led a masterclass-style composition forum in addition to speaking on panels and giving private composition lessons. Bekah holds a DMA from the University of Toronto, where her studies with Gary Kulesha were twice funded by an Ontario Graduate Scholarship. While at the U of T, Bekah received the Karen Kieser Prize in Canadian Music and numerous grants to fund travel to premieres, including a School of Graduate Studies Conference Grant and several Faculty of Music travel grants. Bekah also holds degrees in Theory/Composition and Music Education from Memorial University of Newfoundland. Bekah also engaged in a 6-month private mentoring study with Montreal-based electroacoustic composer Martin Bédard, whose mentorship was facilitated through the PIVOT program. Former teachers include Andrew Staniland, Christos Hatzis, Norbert Palej, Dennis Patrick, Clark Ross, as well as lessons and masterclasses with Salvatore Sciarrino, Hans Abrahamsen, Unsuk Chin, Anna Thorvaldsdottir, George Lewis, Martin Bresnick, Linda Catlin Smith, Chris Paul Harman, Sabrina Schroeder, Christopher Butterfield, Chinary Ung, Michael Colgrass, Mario Garuti, Christopher Theofanidis, and Amy Beth Kirsten. Bekah is an Associate Composer of the Canadian Music Centre and a member of the Canadian League of Composers, SOCAN, and the Association of Canadian Women Composers, where she served as Secretary from 2016-2018. She is also a member of the Music Gallery's Artistic Advisory Council.